It has now been one year since I joined these forums. I can't believe it's been that long already! So, what I'm going to do is make Source Filmmaker images for anybody that wants them! If you want an SFM image for any reason, just post in this topic or send me a PM, and tell me what you'd like to see! I will do my very best to make them! I have no problem re-sizing, so let me know if you want your image to be a certain size! I also may or may not post random images I make. Last edited by Sparky06 on Thu Jun 19, 2014 2:55 pm, edited 9 times in total. I would like a picture of me brutally murdering NKing please! Congrats! You're part of the club now!! If you want, I'd love some sort of frag video-esque thing from me at the finals. But that's prob too hard, so instead I'd just like a super cool scoot pic of me doing something fun. Soup Nazi wrote: Congrats! You're part of the club now!! Uber! wrote: Party and party and YEAH! I'll get to work on those when I can! 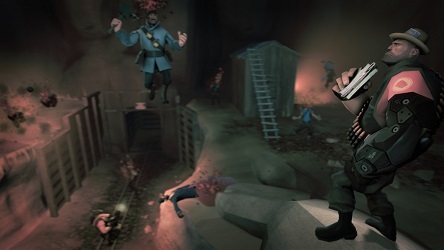 I would like a picture of pyro a wearing a last breath miscellanous, and a Triboniophorus Tyrannus hat axetinguishing a heavy wearing a pink ushanka, a pocket medic and a lunchbox to death. The more awesome you can make the pyro look, and the more foolish you can make the heavy look, the better. I would love to see what you do with a pyro and some fire! Posting to show off Sparky's work. I have a signature now thanks to his awesome work this afternoon. He gave me an awesome high quality image of exactly what I wanted and I dolled it up in Gimp a little bit. You rock Sparky, thanks again! I too am posting to show off Sparky's work in my signature! Like prang said, high quality image this time showing some expert sandvich consumption.